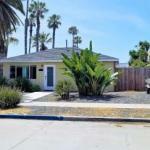 Sunset Cliffs Beach Cottage offers accommodation in San Diego 4.1 km from SeaWorld San Diego and 6 km from Old Town San Diego State Historic Park. Complimentary WiFi is provided. The holiday home includes 2 bedrooms a living room and a bathroom with a hair dryer. A flat-screen TV is featured. The holiday home offers a terrace. A private beach area can be found at the property along with a garden. University of San Diego is 7 km from Sunset Cliffs Beach Cottage while Downtown San Diego is 9 km away. The nearest airport is San Diego International Airport 5 km from the accommodation.